Branding campaigns focus on increasing broad awareness and driving upper funnel metrics, while direct response campaigns are more sophisticated, with the ultimate goal of driving sales. It should therefore come as no surprise that targeting strategies for direct response campaigns are more complex. 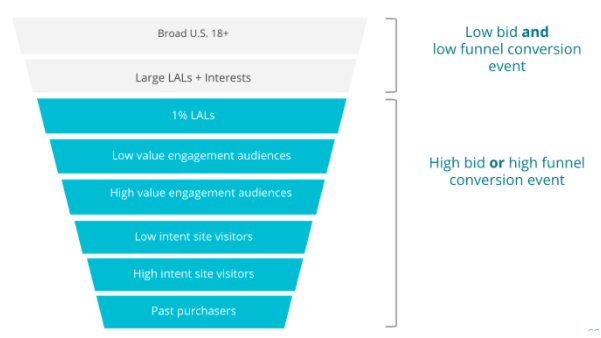 While every direct response campaign comes with its own challenges, target audiences and unique nuances, the following tenets apply to most digital campaigns transacted in programmatic ad auctions, with the goal of driving online sales. One of the most important direct response tools is audience segmentation, at every stage of the customer journey. Differentiating between your customers based on qualities such as lifetime value allows brands to set different goals for different customers. There are several tools you can use to segment your audiences. SocialCode SmartAudience enables brands to get a deeper understanding of the dominant attributes of their customers, and use that knowledge to identify their best potential prospects including how to reach them and how much it will cost. By analyzing your audiences, you can learn who your high-value and/or frequent shoppers are, what demographics are most engaged with your brand, and what audiences represent a future prospecting opportunity or untapped market. Imagine a scenario in which you’re an online home goods retailer with a diverse customer list. You have 18-year-old customers purchasing $300 worth of items on your website once a year, right before moving into a new dorm, and you have 45-year-old customers that frequently buy $1000 worth of merchandise from your website for their beach house. Segmenting audiences is critical because it allows you to differentiate between high-value and low-value customers. Prior to launching your campaign, you should identify what audiences are most important to you. This could be based on several factors; for many retail brands, your highest-value customers could be your most frequent purchasers, members of your loyalty program, or your highest-value shoppers (regardless of the frequency of their shopping behavior). For other companies, breaking into a specific market could be your most important business goal. In that case, the audience at the top of your priority list could be a demographic segment, like women in their thirties living in Chicago. Segmenting audiences and setting different bid goals based on the value of the audience has proven a highly effective strategy for SocialCode’s clients. All else equal, strategic media weighting and optimization across custom CRM segments enabled us to drive an 8% higher return on ad spend (ROAS) at 2X the scale for a midmarket fashion brand. Digital inventory is typically transacted in one of two ways–a direct buy or an auction in which brands bid for ad space. Marketers will often launch a direct response campaign with a specific cost-per-impression or cost-per-action in mind, but smart direct response marketers recognize that not all actions are created equal. When you’re retargeting someone that’s visited your website before, your odds of driving a sale are higher than when you’re targeting someone that’s never heard of your brand. When targeting broadly on digital channels (everyone over the age of 18), or general interest groups like “people interested in sports,” we recommend a low bidding strategy. As you target a smaller and more qualified audience, your bid should be higher, to correspond with the higher quality of this audience. To read our full Direct Response Playbook click here.